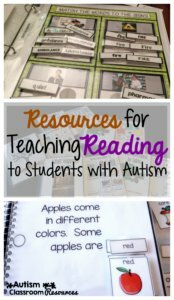 I did a post a while back on the challenges and thoughts about teaching reading to students with autism and many readers had asked for resources to support reading in their classrooms. This post is going to cover some web links, curricula, blog posts, and paid resources from sites like TPT to help teach reading and address some of the shortcomings of reading curricula I talked about in my last post. This is not a comprehensive review of all the curricula or materials available–rather than some resources I know about. I have looked at some of the resources discussed below, but have only used the ones from my stores specifically. However, I have high respect for all the sellers and believe they would be a useful tool for a classroom. If you have favorite resources that you think would be helpful, please share them in the comments about how they have worked in your classroom. 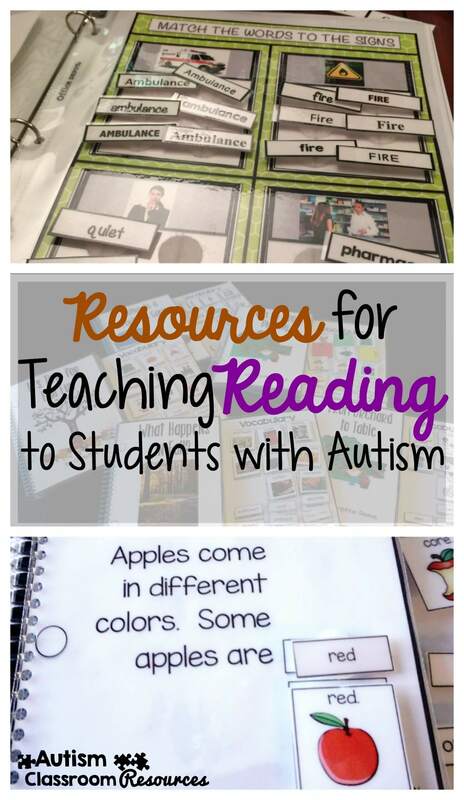 A post I should have referenced in my earlier post was a guest post by Mrs. H’s Resource Room early on in my blog on how she teaches reading to her students with ASD. I talked in my earlier post about using Edmark, PCI and Reading Mastery. They are some of the best tools I’ve found for teaching reading, but all need significant additional materials for addressing teaching comprehension. Here are some posts and websites with information about each of them and other curricula. There are a variety of videos available about PCI, starting with this one that provides an overview of the program. 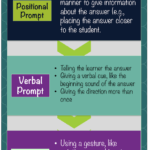 (I think Superteach included it in her post so I will link to it instead of embedding it here). PCI has an environmental print curriculum as well, but I don’t have familiarity with it other than looking at it in conference booths. If anyone has used it, I would love to hear your thoughts about it, especially in comparison to the Edmark Functional Word Series I’ll discuss below. Many of us have used Edmark as one of the oldest, most established sight word programs we had available until PCI came along. There are 2 versions of Edmark: Level 1 and 2 and the Functional Word Series. It is available in a print and computer format. The words in the program parallel the Dolch word list and there are some limited comprehension activities available. One of the biggest disadvantages to the Level 1 and 2 is that they have limited comprehension activities and the ones they do have are a little esoteric to me (put the egg in the car where the egg is bigger than the car doesn’t work for me). 🙂 I have some comprehension resources listed below. Teach-Love-Autism wrote a great review of the Edmark Level systems that goes through extensively the different parts of it. See the Superteach review of Edmark or PCI noted above for an overview of their similarities and differences. This series of videos shows what the Edmark Level 1 looks like and how it can be used. (I do not know why the series seems to begin with Part 2, I couldn’t find part 1). I love the functional word series because it focuses on real-life words that the students can use immediately. I remember being in a classroom many moons ago with a teacher who was trying to use an esoteric reading curriculum with her middle school student with autism. She wanted to teach him the word “the.” I used the functional word series to teach him to read “hamburger” and then find it on a menu. Guess which one was more motivating to him. Because our students always benefit from more work in comprehension than most curricula provide, this is an area that needs supplementing, but the word series does provide some worksheets for generalization of the skills. It focuses on restaurant-fast food words, grocery words, job-work words and community signs. I use this curriculum frequently for secondary students. For students who are working on phonics-approaches, the SRA Reading Mastery program is an excellent tool that I talked more about in my earlier post. More videos about Reading Mastery are also available on the McGraw-Hill YouTube channel on Direct Instruction. Teaching literacy is a broader way of looking at teaching reading. Reading is of course much more than just reading the words on a page but is about being able to use reading as a skill in everyday life. Here are some initial resources for literacy that you might find helpful I will be exploring it more in posts in the future I’m sure. Paula Kluth has probably the most extensive resource of literacy through her books. Here are a list of several posts of hers focusing on literacy with autism. 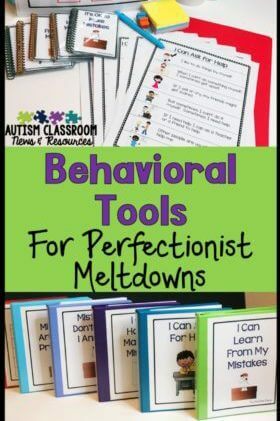 Adventures in the ATC did a great blog post about The Oelwein & Broun method of teaching literacy that is worth reading in terms of teaching students with autism specifically. There are tons of resources out there on reading, but not always reading resources specifically to support either particular curricula or to address the needs of students on the spectrum. While these are resources that can be used independently of a curriculum, the seller who created them designed them for their students using a particular curriculum. They are not designed to replace any curriculum and are not affiliated with the curricula themselves. Superteach56’s TPT Store has a variety of resources to accompany the PCI Reading Program. Click on her name for a few related freebies as well. Erin Hagey from You AUT-a Know’s TPT Store has a variety of resources aligned with the Edmark system that can be used to supplement most sightword programs as well. Teach-Love-Autism’s TPT Store has a variety of resources that align with the Edmark as well that can be found HERE. 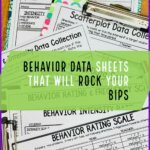 I wrote a post on functional reading skills that included some IEP goal / objective examples that can be helpful using some of my functional reading products. In my store, you will find words that align, for the most part but some words are missing, to some of the units from the Functional Word Series. I am still working on how to do the jobs words, but here is a list of what is currently available. The focus of these products are on working on comprehension because it’s an area that really needs supplemental materials for real-life practice. Reading Functional Sight Words Task Cards Bundle. This bundle includes Grocery Words, Restaurant and Fast Food Words, and Community Signs, each of which can be purchased separately from the page linked above. The picture to the left shows examples of the task cards included. Students have to find the word that matches the picture. Reading Functional Sight Words Matching Materials-BUNDLE. This bundle includes the same three sets of words as the ones above and each set can also be purchased separately from the page linked here. This set is designed to be file folders (or matching task cards) in which the student had to find the words in multiple fonts to match the pictures. The following are some comprehension resources that are not aligned with curricula that you might be interested in. 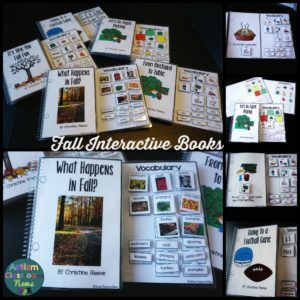 I have a variety of functional literacy activities that involve reading grocery store flyers and ads, sales ads for department stores, and my adaptive interactive books. Primarily Au-Some’s TPT Store has a product for Reading For Main Idea: Autumn School Days Edition that includes passes for the students to read and answer questions with visual supports. Autism Educators’ TPT Store has Reading Comprehension LARGE Task Cards for Special Education/Autism with Data which is designed for early readers and contain simple text and answering questions about them. She also has Picture Comprehension Large Task Cards Sentence Building and Language for Autism that focuses on finding the words to make a sentence based on the picture. 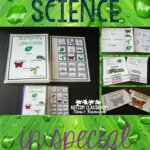 Mrs. P’s Specialties TPT store has a Comprehension Sheets Bundle that includes separate products of worksheets with short text on a variety of topic with comprehension questions. Adventures in the ATC’s TPT store has Beginning Reading Comprehension Worksheets: School Vocabulary that focuses on short passages followed by simple comprehension questions differentiated for 3 different levels of difficulty. Hi, great resources and information. Do you know what I can use fro my 5th grader with reading comprehension problems? Hi Chris, I use PCI Environmental print series and I LOVE it. I have 3 totally nonverbal students and it is the only thing I have found, other than my own creations, to work on comprehension and such with very low functioning children. I teach middle school level and none of my students can read, but they learn environmental print signs , characters, sequencing, and are able to demonstrate comprehension using this series. That’s great, Margi! Thanks for sharing that! I know some people who have started using it with this population and love it!